Eleven destinations, dozens of theme trips geared to your adventure aspirations, camp gear and canoes for rent. Pick your date, leave the rest to us. Because of the Dolores River's 173 mile-length you can choose from several rafting trip options, ranging from two to 12 days. The closest trip to Moab covers 32 miles, beginning in the tiny town of Gateway, Colorado, near the Utah state line, and finishing at the Dewey Bridge, where the Dolores merges with the Colorado. The white-knuckle factor begins early into the trip around an island of rock known as the State Line Rapid. Depending on the water level this chute can range from Class III to V and does require scouting. From here the river winds into Gateway Canyon. Choked with slabs of sandstone the canyon offers a restless stretch of rapids that shame most theme park roller coaster rides. After emerging from the canyon the river eventually sobers into a prolonged calm for the final 13 miles of the trip. Planning ahead is imperative. Due to the combination of a short spring run-off season and the McPhee Dam(n) rafting is limited to April and May and sometimes, June. Consequently, the river does get crowded, creating competitive jockeying for prime camping sites. Permits, though free, are required. Call the Utah BLM at (435) 259-7012 to obtain a permit. Flowing from McPhee Reservoir in Colorado, anglers will find a well-respected tailwater with boulders, runs, riffles and pools and an average width running 10 to 25 yards. 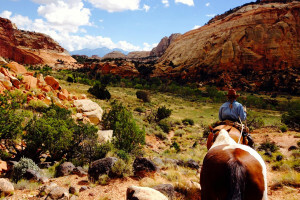 The popular spots include Slick Rock, just below the dam at McPhee and Gypsum Valley. River Characteristics: In Colorado, the Delores is viewed as somewhat of a technical river due to clear flows and picky fish in the summer and fall. They see a lot of flies, so light tippets and pinpoint casts are required. Large terrestrials, as early as April, do well during the heat of the action. Spring can see a little high flows. Drift boat options are best. Species To Target: The Delores is full of Snake River cutthroat, rainbows and browns. The average fish runs about 12 to 14 inches, but trout to 24 inches call the river home. Spring runoff turns the river murky, but for the most part the flows run clear. Getting To The Delores: Heading south on Highway 191, anglers will find themselves at a top spot like Slick Rock after about 100 miles.